Learning to read is a highly emotional journey for young children. The emotionality – and its impact – are often over-looked as we assume our child tells us everything they are feeling. My research project for my MA in Special and Inclusive Education involved exploring the inner world of children’s experiences of learning to read. Through talking to some of the 6 and 7 year-olds in my workshops, I uncovered a beautiful and private world. Children as young as 6 (and I think much younger) read picture books in a way that develops their self and identity, in a way I did not imagine. For example, children place themselves within the books they are reading. The children told me that looking at pictures or reading a book made them want to go and see the places within the books: jungles, forests….For example, reading The Monkey Puzzle Tree made one little girl feel she would travel and see jungles; made her wonder what it would feel like to swing through trees. I saw her horizons in 3-D as she was telling me this. Indeed, research has highlighted that children take traits from characters they hear about/read about within books and build them into their own selves and identities, unconsciously. There is a magic at work when we read, it changes us. All the children I spoke to had profound reactions to the idea of success and failure – feelings about how happy they were to decode a word they thought might be too hard for them literally made them feel on top of the world. I always knew learning to read, or finding reading tricky could be emotional – but the emotional weight invested – and not openly expressed – really surprised me. It moved me. It made me want to change the way reading is experienced. It made me want to protect developing readers from bands and colours and ability structures – hierarchies of ‘ability’ that they know too much about. And are not necessary. This magical and emotional world sits along side a structured and ability-based one. Namely the colour codes of book bands and groupings within phonic lessons. All the children I spoke with measured themselves (and others) against the coloured book bands. It was all consuming. I was left with an overwhelming feeling: how can we keep the magic, distil the magic, and use it to develop all children’s imagination and sense of self development? If I could change one thing in education, it would be this. Too much rests upon early reading identities and experiences to reduce experiences to a sense of competition or ‘ability.’ My PhD project is ‘developing readers, developing self’ and (funding permitting) will focus upon children within Year 1 – I will explore their own perceptions of themselves as readers against the backdrop of their phonics assessment. All my workshops are based on the belief that children’s sense of self is inextricable from their feelings about themselves as readers and their experiences of reading. Creating experiences in reading and spelling that are enjoyable and allow self concept to blossom is my main concern. Working in sensory materials to create a word, your own way, is a powerful and very simple first step. 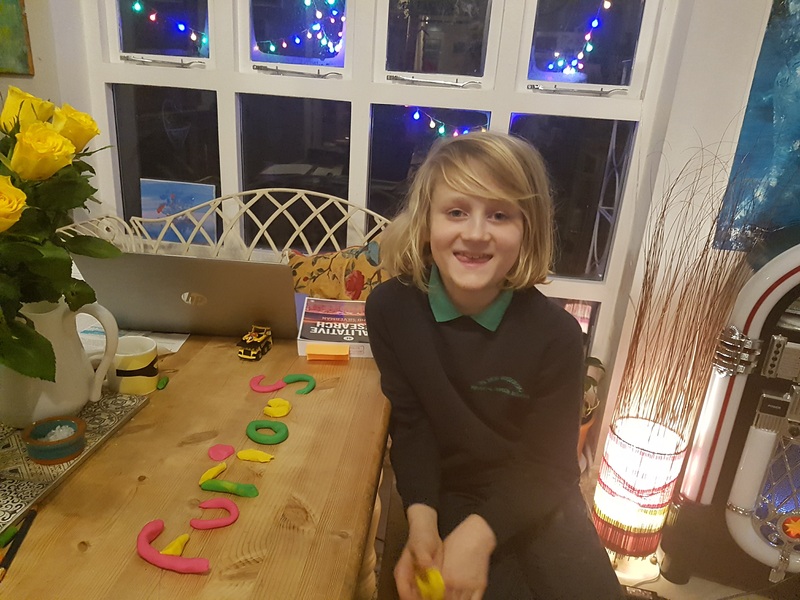 The visual patterning on the word ‘furious’ here gives the child ownership over the word and creates a memorable link. Ultimately, working this way turned homework time into a time of discovery and laughter instead of head-on-the-table, I’m-not-picking-up-my-pencil. Take a photo of the creation and print out, stick it into a scrap book to make a home-made spelling list that they can add to and they have created. Another very simple idea is the sad, ok, happy word boxes (below). 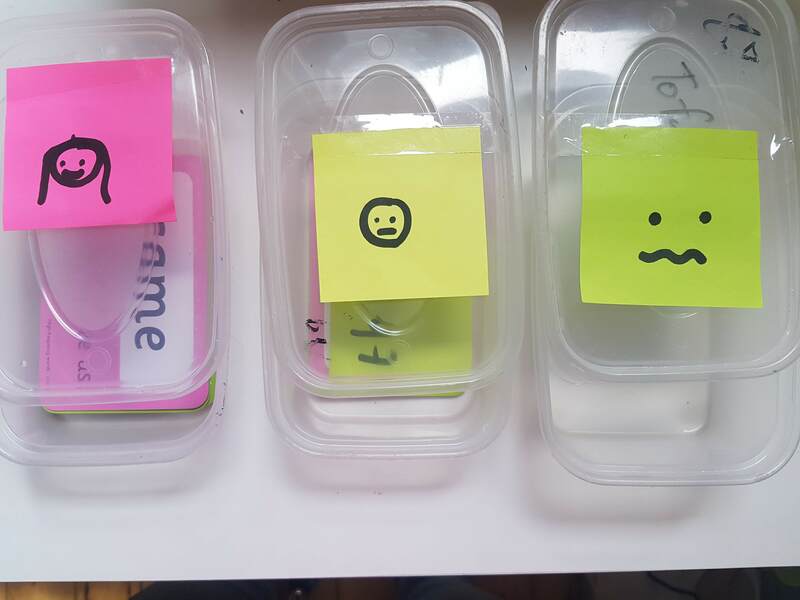 This is a lovely way of making the progress of learning tricky words tangible – you move the words from the sad box to the happy box when you have learnt them. It’s amazing to see how quickly they move over, and the excitement of seeing real words filling up your happy box is very important for children. 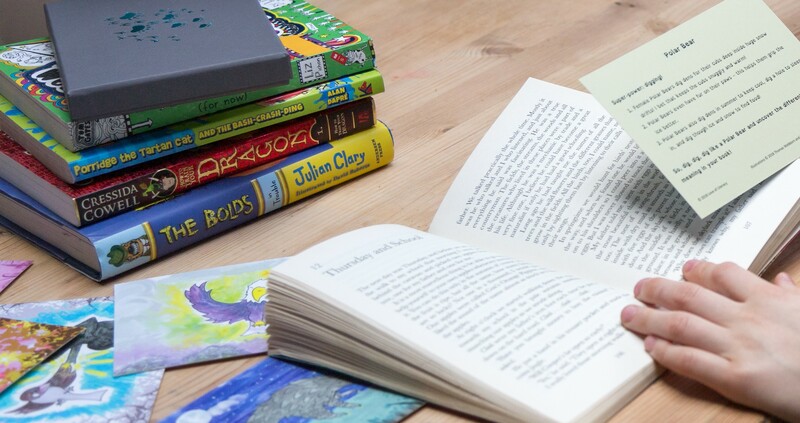 The inner world of young readers is a precious and complex place…let’s fill it with love. I love these ideas and I am going to try them, such an inspiring read as always Kate. I don’t think we understand any where near enough about learning to read in school. I am so glad you are delving deeper and challenging things! I’m glad you like! Let me know things that work.